I wanted to wish you and your family a Happy Holidays! I love this time of year. Much like you, I get to spend time with friends and family and create new memories. I also make sure to reflect on the year's achievements and plan ahead for the next one so I can be sure to help my clients achieve their goals. 2017 has been an amazing year, but 2018 is shaping up to be even bigger. There are some big changes in Conforming Loan Limits that will impact home buying decisions in 2018. I'm continuing to follow tax changes being proposed that will heavily impact the state of California. Plus, I am monitoring tech industry moves that impact all of us in the area, and if you are looking to remodel your kitchen, here are some questions you need to ask yourself first. I have a new listing coming up in January that you need to check out. As you know, I love to share stories of my clients so be sure to check them out and I hope you've been following my market recap and forecasts each month because my predictions this year have been dead on. Whether you are celebrating Christmas, Hanukkah, Kwanza or just enjoying the holidays. I wish you all the best. Spacious and bright single family home in the desirable area around Forest Hill Elementary. 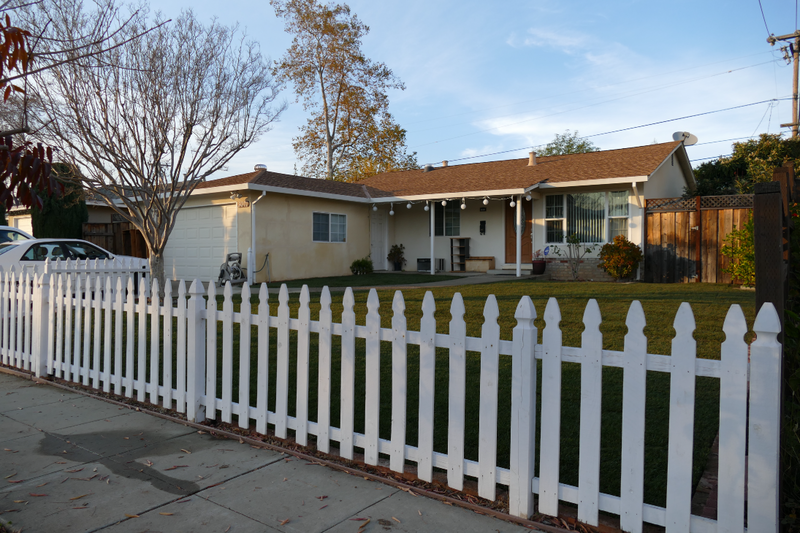 This property features 3 bedrooms, 2 baths, and is 1,300 SF not including the square footage in the finished garage. There is plenty of room for playing in the backyard and the home will have new modern paint inside and out. Will be coming on the market mid January, but contact me if you would like to schedule a pre-MLS appointment. Remodeled Mountain View Townhome @ $1,150,000! The STAR is the home! Fully remodeled townhouse coming in early November. Above picture is artist rendition. Everything will be upgraded from the studs inward using high-end materials and ultra-modern designs. SOLD FOR $5,000 UNDER MARKET! Absolutely gorgeous, and high quality workmanship turnkey home in Aptos very near to the Aptos Village. 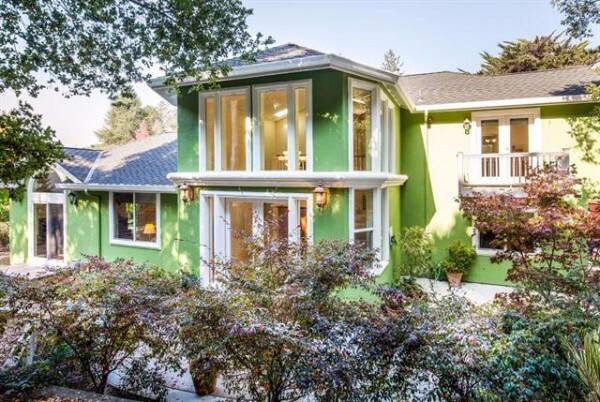 Spacious 3 bed 3 baths on a 17,000+ sf lot. Just appraised at $1,180,000 even though my client is only paying $1,175,000. 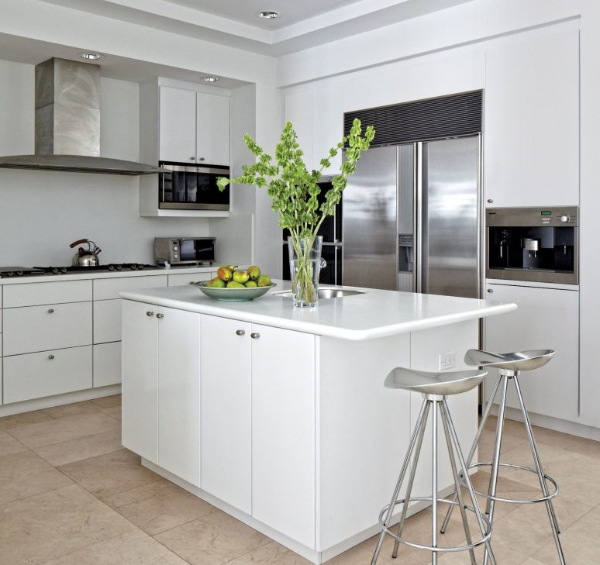 Gourmet kitchen, high-end appliances with plenty of room to expand. In November larger homes jumped the most in value, selling for an average of 4.3% more than in October. Our very low inventory is forcing prices up at rates faster than many of us thought possible. 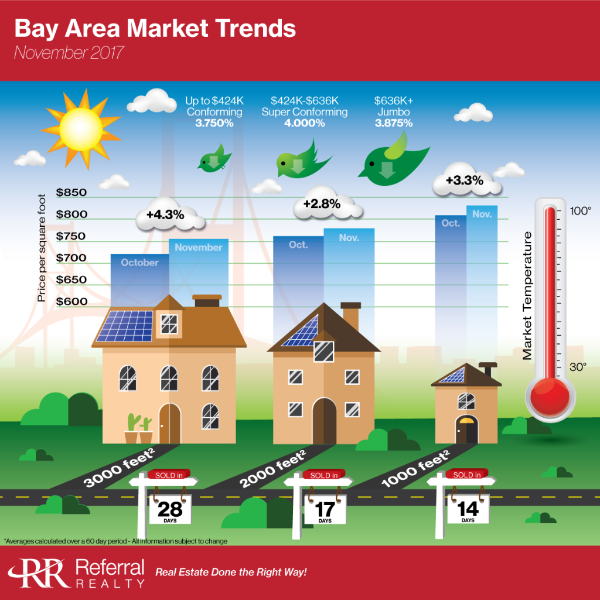 Interest rates stayed flat over the past month, and we're getting a nice bump in the loan limits which will help Bay Area buyers. Our 18 days of market inventory (Market Temp) is right in line with the huge demand for housing we are witnessing, as are the multiple offers we see on 90%+ of all homes for sale. See the infographic below for more market stats and please let me know if you need any advice on how to navigate the market or create a plan for the future. The Federal Housing Finance Agency (FHFA) today announced the maximum conforming loan limits for mortgages to be acquired by Fannie Mae and Freddie Mac in 2018. In most of the U.S., the 2018 maximum conforming loan limit for one-unit properties. In the midst of California's severe housing shortage and a federal tax overhaul, a statewide ballot initiative was quietly submitted this fall with the idea of getting longtime, older owners to sell their homes, freeing them up for younger families to buy. 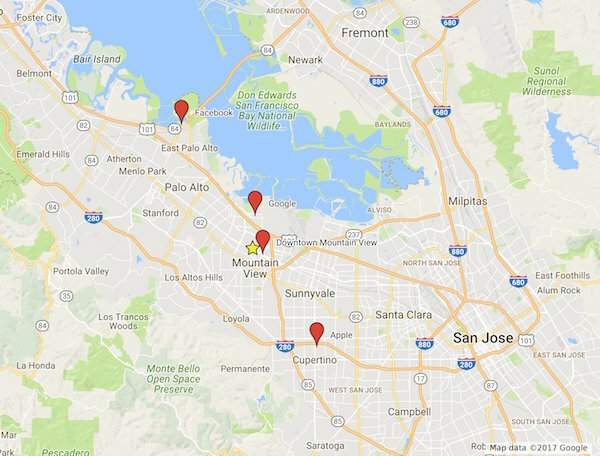 Amazon has extended a burst of Silicon Valley expansion by leasing an office building in North San Jose, according to people familiar with the deal.